Emmanuel St. Priest (Saint Priest) was born to a noble French family. His father, Francois Saint Priest, was the French ambassador to Portugal and Spain, and Minister of War under King Louis XVI, and fled to Russia after the revolution. In 1790, St. Priest went to the University of Heidelberg and after graduation, he joined Prince Conde’s Corps in 1792. The next year, his father helped him to enter the Russian service and join the 2nd Cadet Corps. In 1795, St. Priest was transferred as lieutenant to the Life Guard Semyeonovsky Regiment and later was promoted to captain. In 1799, he left Russia and served in Prince Conde’s Corps as an aide-de-camp to the Duke of Angouleme. Though Napoleon declared amnesty for most of the émigrés, St. Priest was excluded from the list and he returned to Russia. 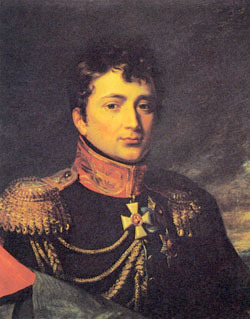 Emperor Alexander let him join the Life Guard Semyeonovsky Regiment. In 1805, St. Priest was appointed commander of the Life Guard Jagers Regiment and took part in the campaign against France. He fought at Austerlitz in December 1805 and was awarded the Order of Saint George (4th Class). During the 1807 Campaign, St. Priest distinguished himself at Lomitten, was seriously wounded there and received the Order of Saint Vladimir (3rd Class). He stayed with the Duke of Angouleme at Mittawa to recuperate, and was appointed chef of the 6th Jager Regiment in 1809. He then joined the Moldavian Army and fought at Bazardjik, Shumla, Batin, Sistov, and Lovech. For his actions, St. Priest was promoted to general aide-de-camp and awarded the Orders of St. Anna (1st Class) and of St. Vladimir (2nd Class). In 1812, he was appointed Chief of Staff of the 2nd Western Army, which was commanded by Peter Bagration. He took part in all actions of this army during its retreat and was wounded at Borodino on 7 September 1812. He then joined Kutuzov as an aide-de-camp and later served in General Wittgenstein’s Corps. After the Russians entered Vilna, Emperor Alexander instructed St. Priest to take care of the French prisoners of war. In 1813, St. Priest commanded the advance guard of Miloradovich’s Corps. He fought at Glogau, Lützen, and Bautzen, was promoted to lieutenant general and then given command of the 8th Infantry Corps. He participated in actions at Hochkirch, Lobau, Wartenburg, and others. He distinguished himself at the battle of Leipzig and at Mainz. During the 1814 Campaign, he advanced from St. Dizier to Rheims, where he was caught by surprise and defeated by Napoleon on 13-14 March. During the battle, he was seriously wounded (a cannonball hit him in the chest) and was transported to Laon, where he died on 29 March 1814.